Guests staying at the Warwick Barsey Hotel Brussels will find themselves in close proximity to the Royal Palace, the Antiques Market, and Louise Avenue, as well as near many public transit stops that can take guests throughout the city. Amenities of this Brussels hotel include an interior garden, meeting rooms, a breakfast buffet, and more. The Warwick Barsey Hotel Brussels is located near many public transit stops, including both the tram and the metro, both of which provide direct transportation to the Brussels Airport, which is located 20 minutes away. The Thalys and Eurostar trains can both be reached from the Midi train station, which is five kilometers from the hotel. Rooms at the Warwick Barsey Hotel Brussels include amenities such as extravagant décor, and all of the features one would expect from a five-star accommodation. 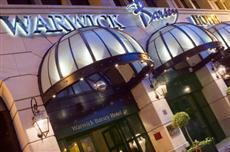 The Warwick Barsey Hotel Brussels is located in the center of the city on the prestigious Avenue Louise. There are many exclusive shops in the area for guests to enjoy, as well as a number of restaurants and museums.